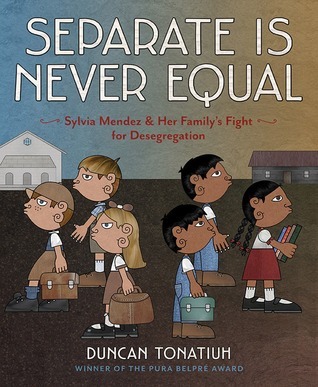 Explore an early battle for desegregation of the California public schools in this picture book. In a court battle that took place seven years before Brown v. Board of Education, Sylvia Mendez and her family fought the system. Having been placed in a Mexican school rather than a “whites only” one due to her Mexican and Puerto Rican heritage, Sylvia and her family realized that she was being given a second-class education because the facilities and teachers were much better in the white school. After appealing the school placement, the full extent of the racism of the system was revealed as the school proceeded to inform Sylvia who spoke perfect English that the other school would help her learn English better. Sylvia’s parents took the battle to court and also organized the Hispanic community to find other students who were being clearly discriminated against. This is a book where people took on a fight for what was right and managed to get things changed. Tonatiuh emphasizes the small and poor vs. large government and wealth throughout this book. He makes sure that young readers understand the extent of the racism against Hispanics and the reality of the policies that they were living under. The issue is complex, but he keeps it clear and concise, offering a solid view of the courage that it took for the Mendez family to fight the system and also making it clear why they were able to fight back when others could not. Tonatiuh’s stylized illustrations pay homage as always to folk art. His characters have glossy hair in different colors that are cut-outs of photographs. The same is true of the fabric of clothes and other objects. This is paired with a flat paint and clear black outlines making a combination that is modern and ageless. An important addition to the civil rights history of the United States, this nonfiction picture book tells a story of courage and determination. Appropriate for ages 6-9. Reviewed from copy received from Abrams. Travel around the world all in a single moment and explore the time zones in this picture book. It all begins at 6:00 in the morning in Senegal where they are counting the fish caught the night before. Then the book moves one time zone after another, so at the same exact time it is 8 am in Bulgaria where a boy chases a school bus. It is also noon in the Himalayas where they are eating lunch. On the pages turn, hour by hour, yet each in the same exact point of time. This book is a tour of not only our world but of the time zones and how we structure time on earth. Perrin has very cleverly created a book that truly displays how time zones work around the world. She has also worked to make this a very inclusive book that celebrates our diversity as well as the time structure that holds us all together. Each page is another country, another way of life, another glimpse into a lifestyle. Perrin’s art is fine-lined and detailed. She plays with light and dark as the day passes as we move around the world. There are details on each of the images that also speak directly to that country. I would have appreciated more information at the end of the book about these touches. At the end of the book is a fold-out map that is very useful and will be critical in getting children to truly understand time zones. It’s a very welcome addition. A clever way to approach time zones, this book comes full circle by the end, returning to the same moment in Senegal. Appropriate for ages 5-8.